There's rosemary, that's for remembrance; pray, love, remember: and there is pansies. that's for thoughts. - Ophelia, Hamlet Act III, Scene V.
I've always loved Ophelia, depite her weaknesses. When I studied Hamlet in school, I was fascinated by her journey; starting as a pure thing, before crumpling like an over-extended flower stem, until she was completely lost. A morbid reason to make a pretty hair-flower, perhaps, but nonetheless a suitable one. Wherever I see pretty, big flowers I think of Ophelia’s great monologue in Hamlet. So, when the idea for this pretty bloom floated into my head, it had a name before it even had a yarn chosen for it. I hope you enjoy wearing it as much as I enjoyed making it. This pattern is crocheted in one continuous piece, cutting down considerably on the amount of weaving-in that would need to be done. 1. ch 5, ss into first ch to close. 10. ch 1, dc9 down left side of petal (i.e. one dc into each row. 10. ch 1, dc 9 down left side of petal (i.e. one dc into each row. Repeat pattern as for second petal until you have five in total. 1. Make two loose ss to centre of flower. The sts you will be working into for the inner petals are already being used by the outer petals. You’ll be working on top of the base dcs for every outer petal. 3. ch 1, *[dc 1, tr 5], [tr5, dc 1]* repeat four more times. 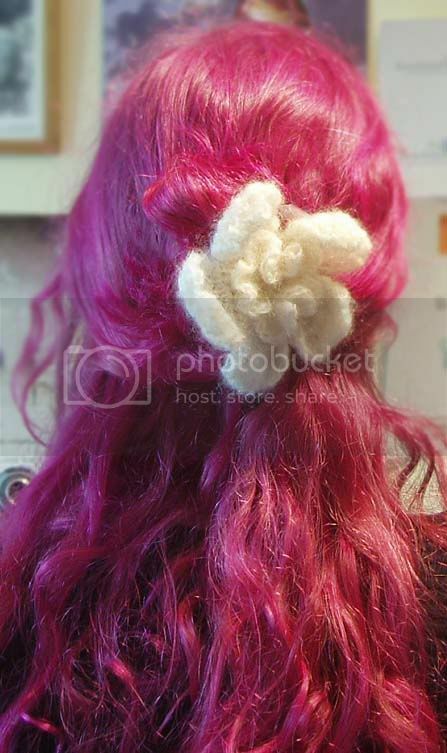 4. ss to close, thread yarn ends through to back of flower, affix a small butterfly clip, weave in ends and wear with pride! Your work is quite beautiful! Thanks for posting. If that's your hair, bravo to you! By the way, thanks for leaving a nice, complimentary comment on my blog which you stumbled into. It was unexpected since I had just posted minutes before your comment came in. I hope to come back to visit Ireland someday. I have relatives in Cong. You remind me of my Irish roots.